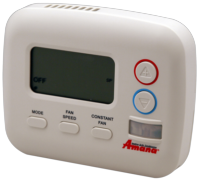 It is powered by 4 AA batteries (2 for back light and 2 for thermostat operation, included) or low-voltage connections. The large LED display and color-coded temperature controls provide easy controls for guest comfort. The PTAC. Temperature settings can be changed at either the unit or the thermostat and changes are automatically relayed to the other device within seconds. The antenna communicates to the Amana DigiSmart suite of devices via an encrypted 2.4 Ghz signal using the 802.15.4 standard. For the remote thermostat to operate, the in-room PTAC must be equipped with a DigiSmart gateway antenna. The occupancy detector in this unit acts only as secondary detection and must be used with both a DD01E and DT01A.